If a newly-revealed list of Achievements is to be believed, we may soon be returning to Jason Brody's violent, allegorical power fantasy. Those of you who've played Far Cry 3 know it as one of the best games released during 2012. It featured gorgeous graphics, an intricately detailed world to explore, and more angry komodo dragons out for blood than even the most terrifying South Pacific hellhole. Unfortunately, the story found in Far Cry 3 didn't leave much room for expansion. Still, with the game winning both adulation from critics and impressive sales figures, it was only a matter of time before Ubisoft found some way to extend the game. To that end, the appearance of a mysterious Achievements list for a title dubbed Far Cry 3: Blood Dragon lends credence to the idea that Ubisoft is planning a downloadable spin-off for the game. Why a spin-off? Why not a sequel? That's a difficult question to answer as it hinges entirely on Ubisoft's internal decision making process, but the best guess we can make is that the Far Cry series has historically consisted of unrelated games, only linked by their impressive aesthetics and certain aspects of each games' technological feats (the ability to start fires and watch them consume large swaths of the countryside, for instance). If Ubisoft wants to stick with this trend, Blood Dragon would have to be directly linked to Far Cry 3, and the number of Achievements found in the list suggest that it isn't going to be a full-fledged sequel. We guess that it will take the form of downloadable content because that's just the easiest way to expand a console game these days, and while Far Cry 3 does have a PC iteration, sales figures dictate that it is, first and foremost, a console title, at least as far as Ubisoft's higher-ups are concerned. That's not much to go on, but it does appear that Blood Dragon will focus on dragons of some kind. Whether that refers to the komodo dragons found in the original incarnation of Far Cry 3, Tolkien-esque flying dragons, or some third option spawned by Jason Brody's periodic hallucinatory drug trips is anyone's guess, but we appreciate that hunting these beasts will be a focus in the expansion. 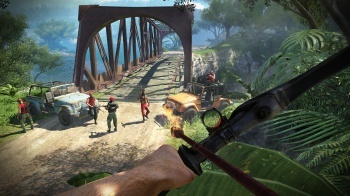 Tracking and killing animals in Far Cry 3 was one of its best features, and easily overshadowed the plot (which went flying off the rails after the first island), so we're all for more reasons to stalk things through the dense foliage before lining up the perfect shot and taking a dragon down with a single, clean arrow to the eye. Obviously, since almost all of this is based on speculation, you should take everything we've said here with a huge grain of salt. A full salt lick, if you've got one. That said, all the evidence we've presented seems conclusive, so expect more information to emerge on Far Cry 3: Blood Dragon in the near future. In the meanwhile, take to the comments and drop your own speculation on what direction this expansion might take.